The New York Post apologised early on Sunday hours after its app was apparently hacked with what was reported to be alerts about President Donald Trump. 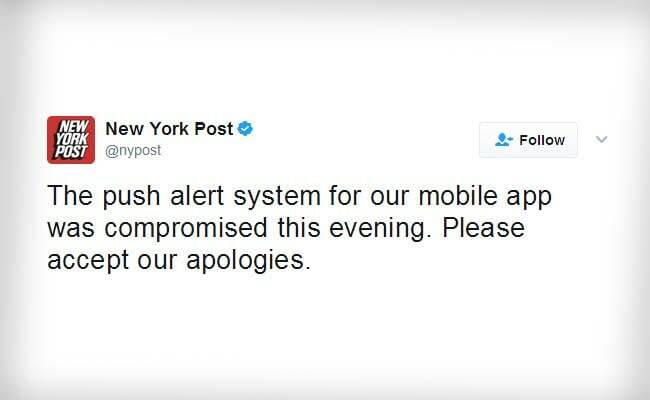 "The push alert system for our mobile app was compromised this evening. Please accept our apologies," the newspaper said on Twitter several hours after the alerts went out. The New York Post tweeted apology after issue became a buzz on social media websites. The tabloid newspaper did not provide details of the alerts from its app, but screen grabs posted online by Twitter users included an alert reading "Heil President Donald Trump!" among a series that ran on Saturday, which was April Fool's Day. Other posts were more cryptic, vague or seemingly religious in nature, with the final one reading "with Lucid Love, Selah," according to media reports and screen shots posted on Twitter. The Post is owned by News Corp.